What are the root causes of poverty and how do we address them? How can we tackle the ways in which income and opportunity are so unevenly spread, within nations and between nations? How do we move towards an economic system that serves the interests of all peoples? And what possible role can religion have in creating such a new model of community life? The reorganisation of human society to meet the needs of humanity is a recurrent theme in the Bahá’í Writings. There is no detailed Bahá’í economic system as such but instead the fundamentals of a true prosperity, one which is both material and spiritual and which serves all the world’s peoples. The Maidenhead Bahá’í community warmly invites all those interested in the prosperity of humankind to join an open study group to be held on Sunday 27 January from 2:30pm to 4:30pm (with a midway break for tea and cake). The group will read and discuss together a letter from the Universal House of Justice, the elected governing council of the worldwide Bahá’í community, on the implications of the Revelation of Bahá’u’lláh for economic life. All are welcome. No previous knowledge of the Bahá’í Faith is required as an introduction will be provided. For more details, please contact Mike Gammage at bahais.maidenhead@gmail.com. To mark the centenary of women’s suffrage in the UK, the Bahá’í community of Maidenhead has arranged an evening to explore what Bahá’ís understand to be a vital and universal spiritual truth: the equal status of women and men. We will look at the connections between women’s equality, peace and economic prosperity. The evening will be enriched by stories of the lives of four extraordinary women who helped to shape the early history of the Bahá’í Faith in the UK – one of them, Honor Kempton (1892-1981), born and raised in Maidenhead. The event will be held on the evening of 18 April at St Luke’s Community Hall. More details are in the attached flyer (below). All welcome! 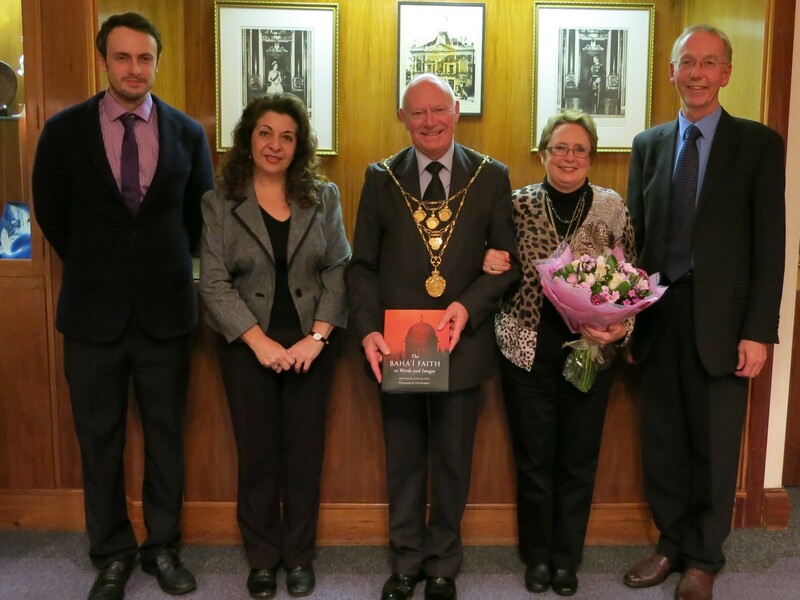 The Mayor of the Royal Borough of Windsor and Maidenhead, Councillor John Lenton, together with the Mayoress, Mrs Margaret Lenton, yesterday attended a reception to mark the bicentenary of the birth of Bahá’u’lláh. Glimpses of the many bicentenary events organised worldwide can be found on a special bicentenary website here. On the occasion of the 200th anniversary of the birth of Bahá’u’lláh, the Bahá’í community of Maidenhead is hosting a series of gatherings to celebrate His life. The gatherings will open with a short devotional of prayers and readings followed by the showing of a film Light to the World commissioned for the bicentenary. The film tells the story of the life of Bahá’u’lláh and the impact of His teachings in transforming the lives of individuals and communities across the planet. These Thursday evening gatherings, which will take place in November, are open to all. They will be hosted in a home, so places are limited. If you would like to attend, please contact Mike Gammage, Secretary, for further details: by email bahaismaidenhead@gmail.com or by phone 01628 637801. 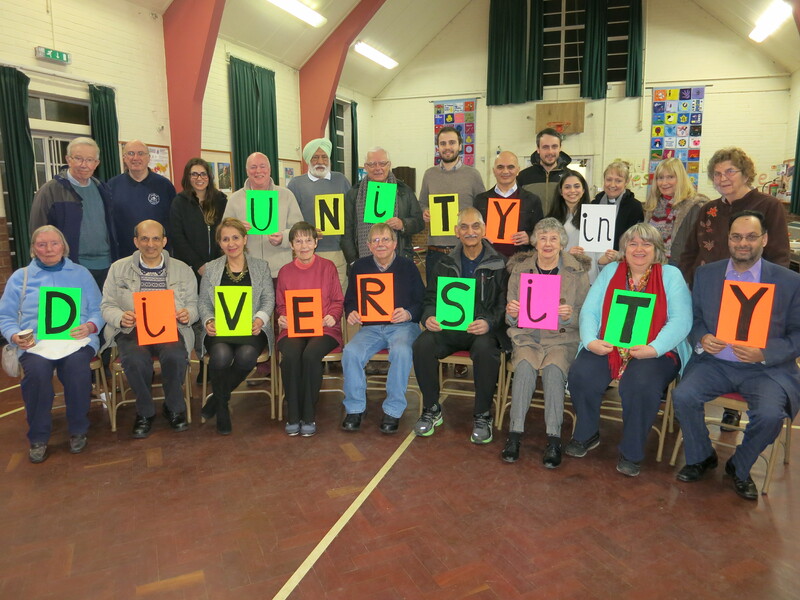 Members of the Maidenhead’s faith communities – together with others with no religious affiliation – this week completed a series of four discussion evenings on religion and peace. Participants have aged from 17 to 75 years – and included agnostics as well as members of Christian, Sikh, Muslim, Jewish, Buddhist, Hindu, Quaker and Bahá’í communities. Organised by the Bahá’í community of Maidenhead, the evenings were hosted by St Mark’s Crescent Methodist Church. Participants studied together and reflected upon a letter to the world’s religious leaders from the international governing body of the worldwide Bahá’í community. The letter, published in 2002, analyses the roots of religious prejudice and conflict, and sets out principles to enable organised religion to play its part in building a peaceful, just and prosperous world for all. There is more on the letter and its impact here. The full text of the letter is available to download here . One God, One Religion – World Peace. Discuss. Religion has an extraordinary capacity to motivate human behaviour. It is capable of profoundly influencing the structure of social relationships. But it is a capacity which can be harnessed for good or ill. How can we ensure that religion is a force for peace in today’s complex world? We invite you to join us in reading together and reflecting upon an open letter to the world’s religious leaders from the governing council of the worldwide Bahá’í community on the challenge of religious unity. These events are open to people of all faiths and none. Do please come and join us. Further details can be found here.